Dharmasthala is a temple town on the banks of the Nethravathi river which is located in the Belthangadi taluk of the Dakshina Kannada district in Karnataka. The town is well known for the Dharmasthala temple which is dedicated to Lord Shiva. The temple houses the shrines of Shiva who is known as Manjunatha along with a goddess who is known as Ammanavaru, and Chandranath and Dharma Daivas who are the guardian spirits of Dharma. The uniqueness of the shrine is that it is run by a Jain administration and the poojas are conducted by Hindu priests. By Air: Mangalore International Airport is the nearest airport, which is about 65 km away from here. It is connected to all the major cities in the country and to a few abroad. By Train: Mangalore Junction is the nearest railway station, which is connected to Bengaluru, Mumbai and major towns and cities of the country. The railway station is around 74 km from here. By Road: One of the best ways to reach Dharmasthala is by road. The town is well connected by roads and there are regular buses which operate from major cities in the state to Dharmasthala. Those who want to opt for Route 1, it would take you approximately around 5 h 45 min to reach Dharmasthala, via Banadadka - Bengaluru Road. The route takes you through the well-known towns of Hassan, Sakleshpur, etc. The roads are well maintained, which helps one to cover the distance at a good pace and the destination is about 297 km through this route. If you opt for Route 2, it would take you approximately 7 h to cover a total distance of 341 km from Bengaluru to Dharmasthala, via NH 275 & NH 75. The journey can be planned as a weekend drive. So, one can opt to leave on a Saturday morning and after spending about a day and half, one can start travelling to Bengaluru either on a Sunday morning or afternoon and reach the city by evening or night. Making a stopover at Nelamangala for a quick and yet filling breakfast of hot dosa would give you all the energy you need until you decide to make the next stop at Hassan for lunch. The roads from Nelamangala take you through the rural side of Karnataka, which is something very different and yet refreshing for those coming from a metropolitan city like Bengaluru. Hassan, which was the seat of the Hoysala empire is home to famous sites of Belur, Halebidu, Shravanabelagola and many sites of archaeological importance. The Chennakesava temple at Belur and the Hoysaleswara temple at Halebidu are architectural marvels which need to be seen. After a filling lunch at Hassan, one can proceed further down to Dharmasthala, which is around 117 km and would take you about 2 h to reach. The Dharmasthala temple is said to be 800 odd years old and Lord Manjunatheshwara is worshipped in an unusual and exceptional manner where the priests are Vaishnavites who actually are followers of Lord Vishnu. Another interesting factor is that the temple is administered by Jain descendants who are known as Heggade. Dharmasthala means the abode of dharma which is the co existence of humanity and faith. The position of the Heggade of Dharmasthala is a very unique one and is unknown to many other religious centres in the country. 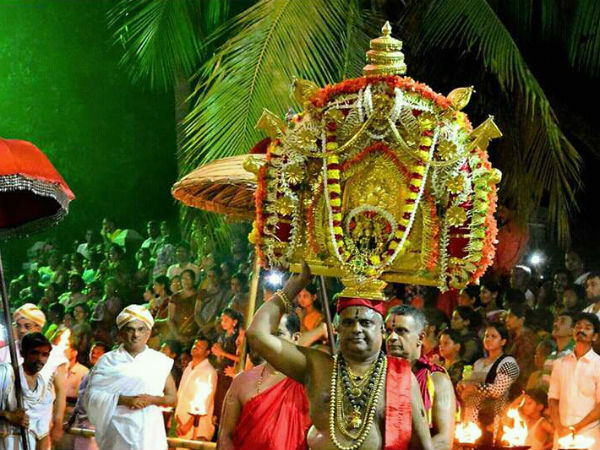 As per tradition, the Heggade represents Lord Manjunatha himself.The Heggade is the religious and installed head of Sri Manjunatha Swamy Temple. Dr. D. Veerendra Heggade is the current head and takes care of all the responsibilities as per tradition. The centuries old Sri Chandranatha Swamy Basadi is another attraction in the area which is well maintained and is one amongst the most worshiped and celebrated Digambara shrines in South India. The meeting of faiths makes Dharmasthala truly worth its name and keeps up to its legacy over the years. A Bahubali statue is placed atop the hillock of Ratnagiri which is about a kilometre away from the Manjunatha temple. The 39 ft tall sculpture was installed in February 1982 by Dr. D. Veerendra Heggade.